This is stellarcollapse.org, a website aimed at providing resources supporting research in stellar collapse, core-collapse supernovae, neutron stars, and gamma-ray bursts. New paper out by Fedrow et al., arXiv:1704.07383. Learn more and access data at https://stellarcollapse.org/bbhgas! Richers et al., arXiv:1701.02752 carried out more than 1800 axisymmetric general-relativistic simulations of rotating core collapse, using 18 different nuclear equations of state. The gravitational waveforms are available here on stellarcollapse.org! New version of SNEC -- The SuperNova Explosion Code available! Read more about New version of SNEC -- The SuperNova Explosion Code available! We have released version 1.01 of SNEC -- it's available for download from stellarcollapse.org/SNEC. SNEC 1.01 implements the same physics as SNEC 1.00, but is about a factor of two faster thanks to various optimizations. How loud are Neutron Star Mergers? Read more about How loud are Neutron Star Mergers? Our new paper led by Sebastiano Bernuzzi is out in Physical Review D! 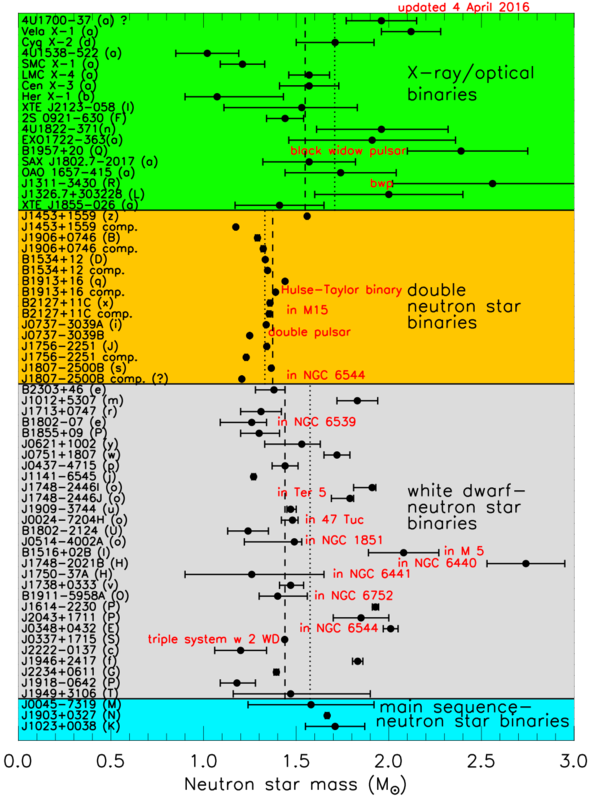 The paper is about a large set of neutron star merger simulations, using three different finite-temperature nuclear equation of state and binary parameters motivated by the galactic double neutron star population. 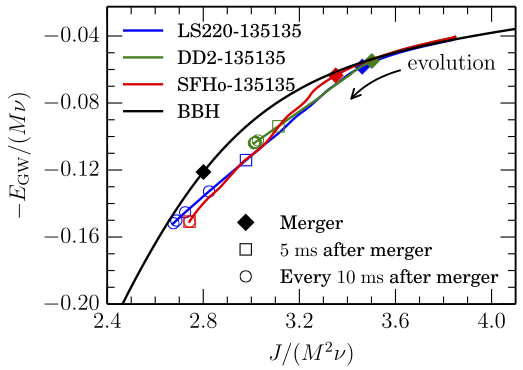 Our focus was on how "loud" these mergers are in gravitational waves and what phase of their evolution is the "loudest". Updated Neutron Star Mass Table! 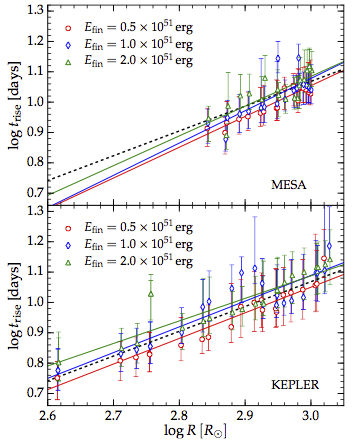 Read more about Updated Neutron Star Mass Table! "Numerical Modeling of the Early Light Curves of Type IIP Supernovae", submitted to ApJ, arXiv:1603.08530. We don't just do core collapse: New Neutron Star Merger results in! Read more about We don't just do core collapse: New Neutron Star Merger results in! Welcome to the new stellarcollapse.org! We just completed the move to a new server with faster CPUs and more disk space. We have upgraded the content management system from Drupal 6 to Drupal 8. Stay tuned for more simulation results that will appear soon on stellarcollapse.org! Please contact Christian Ott at cott #at# tapir.caltech.edu if you notice any problems with the site. Mösta et al. recently published a break-through study on magnetoturbulence in rapidly rotating stellar collapse in Nature. They show that magnetohydrodynamic turbulence in the shear layer around a newly born proto-neutron star kicks off a highly efficient dynamo process that creates large-scale, ordered magnetar-strength (> 10^15 G) magnetic field. This field is strong enough to power hyperenergetic type Ic-bl explosions, a rare but extreme subclass of core-collapse supernovae, that are 10x more energetic than the average garden-variety supernovae and also make up all supernovae connected to long gamma-ray bursts. In addition, their simulations provide a first glimpse on a formation scenario for magnetars, very strongly magnetized neutron stars, that are left behind in these explosions. The source code used to run the simulations and the initial data are available here. They have also created 3D visualizations of the magnetic field amplification in their simulations, embedded below.